Part 3 – Calculating Altitude and Azimuth at the DR Position by Spherical Trigonometry. There are several ways of calculating the azimuth and altitude at the DR position; these include the use of sight reduction methods and software solutions. However, the traditional method is by the use of spherical trigonometry which is demonstrated below. X is the position of a celestial body in the Celestial Sphere and U is its Geographical Position on the surface of the Earth. B is the position of an observer on the surface of the Earth and Z is the zenith of that position. P is the celestial North Pole and N is the Earth’s North Pole. 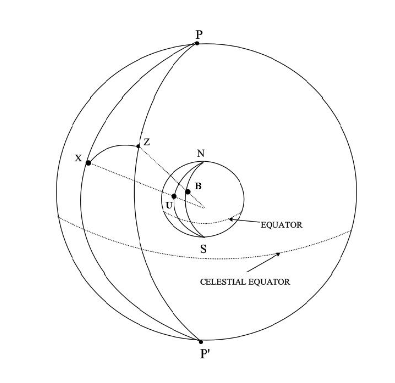 Example of the use of spherical trigonometry to calculate the azimuth and altitude of a celestial body. Note. Traditionally, the ‘half-haversine’ formula was used for this task but this formula does not lend itself well to solution by electronic calculator; therefore, the following solutions which involve the cosine formula have been developed.